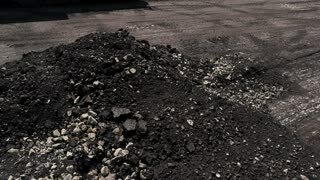 Search Results for "destroy city"
Milled asphalt pile. Small rocks on the ground. City roads will be reconstructed. Destroy and build. Destroyed city series: Aerial tracking shot over a busy city street with several burned or destroyed buildings. Aerial drone scene of destroyed city by natural catastrophe. Camera flying down. Sad Cityscape landscape. Demolished and abandoned city and lake with cloud reflections. Aerial drone scene of destroyed city. Fast movement of camera between a demolished house, huge pile of bricks and doors frames. Sad city landscape. Aerial drone scene of destroyed city by natural catastrophy. Camera flys through the city from low altitud up to a higher view. Sad landscape, Cityscape. Demolished city. Aerial drone scene of destroyed city by natural catastrophe. Camera flys through the demolished city. Sad urban landscape. Quickly, fast scene of mud streets of destroyed city because of natural hazard. Demolished houses, streets, whole city. Frome pedestrian view to aerial panoramic view. Aerial drone scene of destroyed city by natural catastrophe. Camera flying from low altitude to panoramic view. Fast speed of camera, Sad Cityscape landscape. Demolished and abandoned city and lake with cloud reflections. Aerial drone scene of destroyed city by natural catastrophy. Camera flys through the demolished city. Sad urban landscape. Aerial drone scene of destroyed city by natural catastrophe. Camera starts at ground point and elevates to a panoramic view of the demolished town. Sad Landscape. War. Drone scene of destroyed city by natural catastrophe. Camera flying low between dead trees. Sad Cityscape landscape in a Demolished cit, Epecuen in Buenos Aires Argentina. Aerial drone scene of demolished, destroyed city. Detail of a single house, camera rotates capturing the front of the house. Sad landscape. Aerial drone scene of demolished, destroyed city. Camera moves to the side panning through the city streets. Urban landscape. Houses made rubble, damaged by natural disaster. Aerial Drone scene of demolished destroyed city. Camera panning over an abandoned house. Epecuen, Argentina. Aerial drone scene of destroyed city by natural catastrophe. Camera moves fast through an abandoned mud street. Demolished houses and urban structures. Sad Landscape. War. Drone scene of destroyed city by natural catastrophe. Camera flying low close to a concrete seat and then rises high to an open view of sad Cityscape landscape and lake in a Demolished cit, Epecuen in Buenos Aires Argentina. Drone scene of destroyed city by natural catastrophe. Camera flying low between dead trees over an abandoned path eroded by water and rains in a sad Cityscape landscape in a Demolished cit, Epecuen in Buenos Aires Argentina. Drone Scene on destroyed abandoned city. Grey dirty street. Epecuen argentina. Camera flying fast close to the floor. Aerial drone scene of destroyed, demolished, city, neighbourhood, camera flying slowly to the lake. Urban landscape. Camera panning form top scene to the horizon. Drone Scene on destroyed abandoned city. Grey dirty street. Epecuen argentina. Camera flying slow close to the floor.